Yuketen's meticulously crafted Goodyear-welt construction footwear is hand-lasted and bench-made in Mexico. The shoe is built upon a sturdy foundation of leather, rubber, steel and thread and places a remarkable four layers of leather underfoot. The outsole applied to the Derby with Ripple sole was originally developed for use by paratroopers during the Second World War, with the intent of softening their feet-first landing. The design lives on and gives the shoes a striking sawtooth base. Our ripple soles, produced by Vibram, are speckled with cork chips for further visual differentiation. The outsoles are cemented to a composition rubber wedge and vegetable-tanned leather midsole. The two wedges at the base of the shoe help provide structure as well as cushion, while the leather midsole allows the shoe to take to the distinct shape of the wearer's foot over time. Finally, the leather welt is firmly attached to the midsole with a vintage German-made welt stitcher and then notched by hand for added security. The construction of the interior of the shoe begins with the channeled vegetable-tanned leather insole. Many shoemakers no longer use a channeled insole for Goodyear-welt construction, instead opting for faster and cheaper production methods. 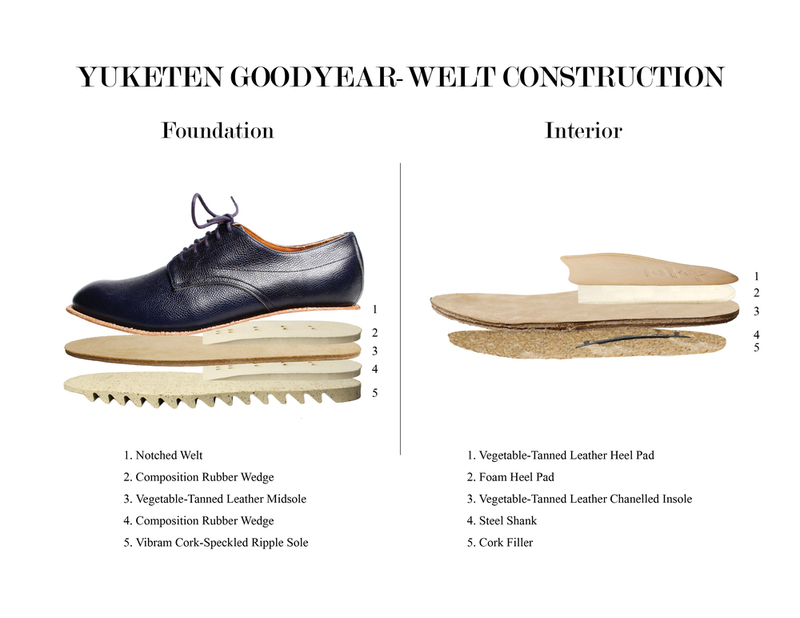 We here at Yuketen believe, however, that a true channeled insole is still the best way to construct Goodyear-welted shoes due to the inherent structural qualities of the leather used for our insoles. The channeled insole cavity is filled with cork for additional absorption and moldability once the insoles have been sewn to the shoes' upper. A steel shank, foam heel pad and vegetable-tanned leather heel pad surround the insole on the interior of the shoe. The heel pad and steel shank provide a measure of structure in the rear portion of the shoe, while still allowing the shoe to flex where necessary at the ball of the foot. The pad and shank also work to provide a stable bridge along the arch of the foot, allowing pressure to be spread and diffused more evenly across the bottom of the foot, resulting in a more comfortable shoe. The foam heel pad provides a final layer of shock absorption and the leather heel pad, in conjunction with the leather insole, provides a full vegetable-tanned leather footbed from heel to toe. This uncompromising approach to Goodyear-welt footwear construction yields shoes of the utmost quality. Visually striking and thoroughly considered, Yuketen's bench-made Goodyear-welt shoes are sure to bring comfort and satisfaction to the wearer.